A #20 Trout Candy tied with #15 red and white glass beads and a body of red and black stretch beading cord. and a #20 Black Haretron midge with a tying thread hot spot behind the silver lined clear glass bead. Those look absolutely deadly! Could you take a picture of the bottom one wet? I'd like to see how much the underbody shows through once it gets wet. Hideous beasties they are. The trout should eat them right up. I'm curious about that bottom one as well. Are these for still water fishing, Bill? Getting it wet doesn't allow the thread under color to show through but I am sure a little casting and fish wear will do that. Bill these are tied for all waters since midges are so prevalent. I have had midge patterns save the day on still waters, tailwater fishing, rivers and spring creeks. The Trout Candy tied in #16 is the first thing I am trying in some Central Oregon lakes this year. Thank you Bill, for the extra photos and descriptions. Very helpful. 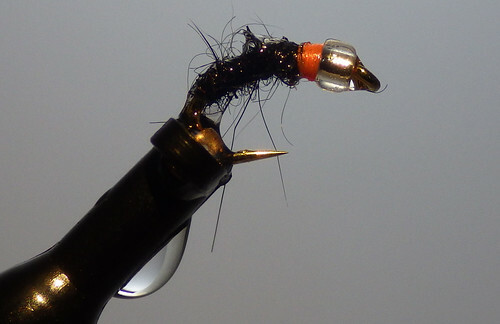 Here is a link to my tying friend Bob's step by step for his Trout Candy. I have already tied them in #16-20s and may tie some 14s for eastern Oregon alkaline lakes where some of the midges are monsters like some of the fish. 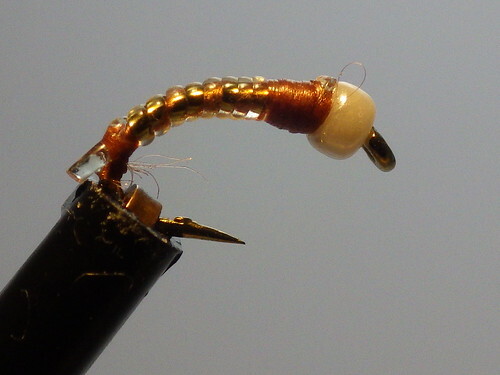 I tie some of my TDC midges in 9672 #10s. Modern Midges by Takahashi and Hubka is my newest go to resource for midges but I also have a fondness for the tying style in Midge Magic by Holbrook and Koch. These patterns are awesome! Size twenty? I know that midges are minute but WOW yours are crazy good! I like the very last one your tied with the "translucence" that is bound to kill!